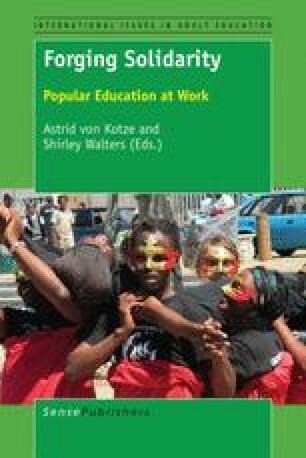 This chapter sets out to explicate All Together in Dignity (ATD) Fourth World, a movement founded by people in extreme poverty, and its approach, developed within a range of contexts and countries. We describe who we are talking about when we say ‘people in extreme poverty’ and how we see the differences between charity and solidarity. We give background to the approaches that have developed over time, and sketch two vignettes to provide the reader with a flavour of the challenges in our work. We then discuss the pedagogical approaches to challenging the politics of knowledge and the reasoning behind them.